Saori was an anime-only character who appeared in the SuperS season. She was a friend of Mamoru's who attended the same high school and university as him. She had a crush on Mamoru, but didn't realize that their mutual friend Kobayashi had a crush on her. 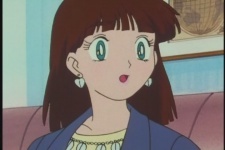 Even after meeting Usagi and Chibiusa, she planned to confess her love for Mamoru and give him a tie she'd bought because she thought Usagi was not really a "serious" girlfriend for Mamoru. She was one of Tiger's Eye's Dream Mirror targets, so she became a spectator to one of Super Sailor Moon's battles with a Lemures. During this battle Mamoru was almost attacked but Super Sailor Moon threw herself in the Lemures' path to protect him. Mamoru, fearful for Super Sailor Moon's life, called out his nickname for her (Usako). Saori not only realized that Usagi was Super Sailor Moon, but she saw how strong Usagi and Mamoru's love really was. She then decided to give the tie to Kobayashi instead, saying that there was no way she could win against the girl who protected peace all over the world.